We’re getting low on Parker-parts, but tonight I thawed a brick of ground lamb to make lamb and white bean chili from the New York Times recipe. 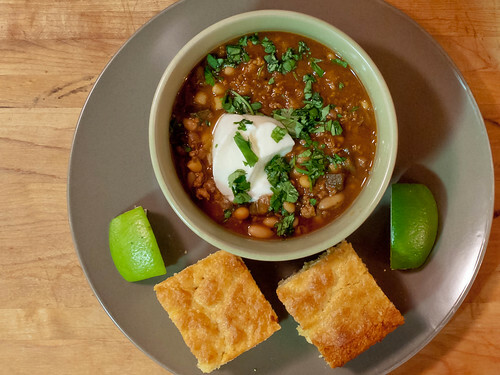 I prepared the chili using Penzeys Chili 9000, because I thought the powder’s modern, bright notes would mesh with the lime and cilantro that are served with the chili. I threw in some extra cayenne powder and ancho powder as well. With about 15 minutes to go in regulation, I tasted the chili and my impression was a dull attack, followed by the chili powder and pepper flavors. To add complexity to the initial bite, I added half a bottle of dark beer, and a good quantity of apple cider vinegar. The additional liquid prolonged the cooking, and allowed the flavors to meld some more. The final result was very good, with the limes and yogurt helping to provide some needed acidity. If I were making it again, I would replace some of the water with a bottle or two of beer, and add a can of tomatoes to boost the acidity further. That looks fiery & delicious - I'll have to try the chili 9000.